A clear role for the growth hormone secretagogues has yet to be demonstrated. The secretagogues have both potential advantages and disadvantages compared to recombinant human GH. GH replacement therapy requires parenteral administration and results in a nonphysiologic serum GH profile with often supraphysiologic levels. Particularly in older individuals, these characteristics may contribute to the poor clinical tolerability that has been reported in several clinical trials (49-52). In contrast, the longer acting secre-tagogues, or frequent dosing with the shorter acting compounds, may result in increased GH secretion in a physiologic pattern, resulting in improved tolerability. In addition, oral (or intranasal) dosing is possible. In other indications where a modest physiologic increase in GH and IGF-1 levels is desirable, secretagogues may have advantages compared to the use of GH. However, it is likely that with chronic dosing with a secretagogue, supraphysiologic levels of GH similar to those achieved with recombinant GH therapy will not be sustained. In conditions of relative GH resistance where GH therapy is currently being explored (e.g., wound healing, post-surgical rehabilitation) (53-56) or used (e.g., AIDS wasting) (57), the secretagogues may have limited or no efficacy. With any new chemical entity, use of these compounds may be accompanied by unknown risks that will require careful evaluation. GH deficient short stature may be owing to defects at the pituitary, the hypothalamus, or at the level of the CNS pulse generator. Idiopathic GH deficiency, probably as a result of hypothalamic or neurosecretory defects, accounts for the majority of GH deficiency in children (58). One of the potential clinical applications of the secretagogues could be to aid in identifying the etiology of GH deficiency. Just as with the more classical GH testing agents such as insulin, L-DOPA and clonidine, values for normal responsiveness could be established. Abnormal responders could be tested in combination with GHRH to differentiate between pituitary and higher defects. Determination of normal values for responsiveness to the secretagogues will need to take pubertal development into account since in short normal children, the GH secretory response to hexarelin also appears to vary with pubertal status (59). GH Deficient Children. Several groups have tested growth hormone secretagogues in GH deficient children. Loche et al. (27) administered hexarelin (2 ^g/kg iv) to 15 children and 4 adults who met classical criteria for GH deficiency and in whom GH therapy was discontinued 2-4 wk prior to testing. Forty-five short normal children were tested as controls. In patients with organic defects based on MRI, hexarelin stimulated a mean peak GH response of 5.5 ± 2.3 ng/mL. In contrast, short normal children and children with idiopathic GH deficiency exhibited mean peak GH responses of 51.7 ± 3.7 ng/mL and 63.0 ± 6.5 ng/mL, respectively. Several other groups have found that a subset of GH deficient children respond to growth hormone secretagogues with GH secretion. In a group of nine Russian children with GH deficiency, Tiulpakov et al. (60) tested a single intravenous dose of GHRP-2 (1 ^g/kg). One child had a peak GH response >30 ng/mL; three children exhibited a peak GH response of1-1.5 ng/mL, and the remainder had responses <1 ng/mL. In five children with idiopathic short stature, the peak GH response ranged from 8.7 to >100 ng/mL (Fig. 6). Mericq et al. (61) administered GHRP-1 (1 ^g/kg iv) to 22 prepubertal GH deficient children. Approximately 60% of tested subjects had a significant response, defined as fourfold times the standard deviation of the GH assay. However, the mean response was 7.5 ± 8.0 ng/mL, substantially less than the response reported in normal subjects. Subsequently, patients who responded to a single dose were treated daily with GHRP-2 (0.3 ^g/kg sc). Doses were increased to 1 ^g/kg and 3 ^g/kg at 2-month intervals. After six months of treatment, mean growth velocity approximately doubled (2.5 ± 0.5 cm/yr to 5.6 ± 1.5 cm/yr), but there was no significant change in serum IGF-1 level (62). Fig. 6. GH secretory response to a single bolus dose of GHRP-2 (1 ¡¡g/kg, iv) in children with GH deficiency (Group A, n = 9) and children with idiopathic short stature (Group B, n = 5). Adapted from Tiulpakov et al. (60). are intact, achieving clinically similar growth velocities to those seen with GH treatment may not be possible with secretagogues. Alternatively, the supraphysiologic GH levels (and growth velocities) achieved with recombinant GH may result in a state of GH receptor downregulation (63) leading to the declining growth velocities seen with increasing duration of GH treatment. The more physiologic levels and patterns of GH attained with secretagogues may result in growth velocities initially slower than those seen with GH, but more constant over a period of years, possibly resulting in similar gains in adult height. Additionally, the studies described above (27,60,62) were performed with short-acting peptide secretagogues. Clinical use of a longer acting secretagogue may provide different pharmacodynamic responses, leading to a different degree of clinical efficacy. Finally, the cohorts of GH deficient children tested in the latter two studies may not be representative of the majority of children currently diagnosed as GH deficient and on replacement therapy. Based on the mechanism of action of the growth hormone secretagogues, one might expect that the most profoundly deficient children, i.e., those most likely to have pituitary defects, would be least likely to respond to secretagogues. In contrast, as GH has become widely available since 1985, the criteria for diagnosis of deficiency have become less stringent. Thus, a larger fraction of the GH deficient population in the United States (and possibly Europe) may be 'responders' to growth hormone secretagogues. In spite of the modest clinical efficacy described (62), additional clinical trials of growth hormone secretagogues, with efficacy assessed by growth velocity, seem warranted. Non-GHD Short Stature. Several groups have investigated the use of growth hormone secretagogues in non-GH deficient short stature. These studies include the group reported by Tiulpakov (64), Laron (65), and Bellone (66). In each case, the GH response to growth hormone secretagogues was higher than that of GH deficient children and similar to historical reports of the response in children of normal stature. As these children would be expected to have normal hypothalamic/pituitary axes, a 'normal' response to the growth hormone secretagogues is not surprising. Whether this would translate into increased adult height after chronic therapy is unclear since the benefits of GH in this population are also not well defined. 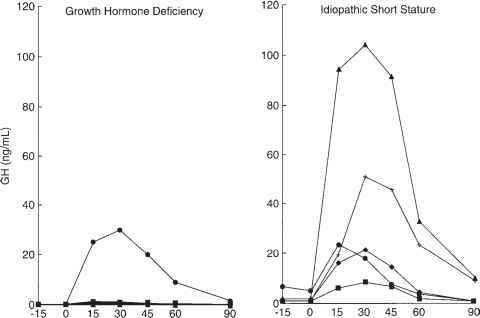 Use of growth hormone secretagogues in non-GH deficient short stature should be limited to controlled clinical studies in children with extreme short stature where clinical use may be more justified and efficacy can be defined. Renal Failure. Recombinant human GH is approved for treatment of growth failure in children with renal failure. In adults with chronic renal failure, hexarelin has been demonstrated to stimulate secretion of GH (67). 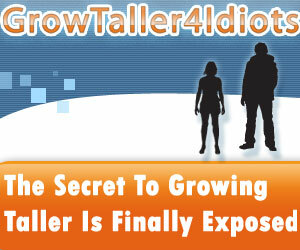 Thus, it is possible that the growth hormone secretagogues may be useful in improving growth in this population. However, it is unknown whether sufficiently high levels of GH can be stimulated chronically, in order to demonstrate clinical efficacy. Prior to pursuing efficacy trials in this population, pilot studies to demonstrate hormonal responsiveness to growth hormone secretagogues would be needed. Turner's Syndrome. Recombinant human GH is approved for treatment of short stature in Turner's Syndrome. As these patients would be expected to have normal hypothalamic-pituitary axes, a pilot study to demonstrate hormonal responsiveness to growth hormone secretagogues would be warranted prior to further exploration of clinical efficacy. Several clinical conditions are associated with decreased growth hormone (GH) bioac-tivity. GH deficiency by classical criteria as well as normal aging and are associated with decreased GH secretion. In addition, a wide variety of catabolic conditions, including Type 1 diabetes, post-operative recovery and malnutrition from a variety of causes are characterized by relative GH resistance, resulting in elevated levels of GH and decreased circulating IGF-1 (68). The rationale for treatment and the therapeutic potential of growth hormone secretagogues in these conditions are discussed below in GH Deficient Adults. GH Deficient Adults. Adults who meet the classical criteria for GH deficiency, either as a continuing condition from childhood or through secondary (acquired) deficiency, comprise the most obvious category of adults who might benefit from secretagogue treatment. Adults with growth hormone deficiency have been shown to have decreased muscle mass, increased fat mass, and are at increased risk for cardiovascular disease and early mortality (69). The clinical use of GH in these individuals has been approved in several countries in Europe, and was recently approved in the US. However, the majority of these patients, with secondary GH deficiency after irradiation or surgery, are unlikely to be responders. Nevertheless, the subset who are responders may benefit from the use of growth hormone secretagogues to the same extent that GH replacement is beneficial in this population. Additionally, since GH is less well tolerated with increasing age, if secretagogues could result in a more physiologic GH profile, they may exhibit a better tolerability profile. Fig. 7. Decrease in circulating IGF-I and GH secretion with advancing age. Integrated concentration of GH was determined every 20 min for 24 h in 173 nonobese subjects from 7-65 yr of age. Adapted from Juul et al. (107) and Zadik et al. (70). Aging. GH secretion wanes with age, such that by the seventh decade, secretion may be only 60% of that of a young adult (70). Many elderly subjects have endogenous GH and IGF-1 levels that fall in the range of classically GH deficient patients (71,72) (Fig. 7). In parallel with the decrease in GH, there is an age-related loss of muscle mass and strength that contributes to the musculoskeletal impairment associated with the frailty of old age. Acute illness, surgery, or traumatic injury resulting in immobilization contribute to additional loss of muscle mass. GH receptors are present on muscle tissue, and GH has an important anabolic effect on muscle (73). Therefore, replacement of GH to young adult levels may have a beneficial effect on strength and function in the frail or immobilized elderly. Rudman et al. (74) tested this hypothesis in a landmark study in which 12 healthy elderly men with low serum IGF-1 treated with recombinant human GH after a 6-mo baseline period. Results were compared to nine untreated controls. 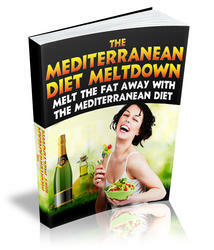 The treated group demonstrated an increase in IGF-1 and lean mass and a decrease in fat mass (Fig. 8). Since that time, several other groups have been able to replicate the effects of GH on body composition and muscle mass. Despite these accomplishments, the goal of demonstrating an increase in strength and/or function with growth hormone treatment of elderly subjects has proven elusive in most studies to date (50,52,75). However, in a double blind, placebo controlled trial, one group (76) recently demonstrated a 10-12% increase in muscle strength in healthy elderly after three months of treatment with relatively low doses (0.03 mg/kg tiw) of recombinant human GH. Limited demonstration of efficacy in the majority of studies may have been owing to several factors. In most cases, the study sample size was small. In addition, all groups to date have studied healthy elderly subjects, where demonstration of functional improvement may be most difficult. In addition, poor tolerability of exogenous GH resulted in the need to decrease doses in most studies. Tolerability in this population may be related to the non-physiologic manner of delivery and often, supraphysiologic levels of GH attained. Growth hormone secretagogues may therefore have a distinct advantage over rhGH in this population. Secretagogues with oral bioavailability are under evaluation (6,11,37,40,48,66,77-80). Hexarelin 2 ^g/kg iv has been demonstrated to stimulate GH secretion in elderly subjects (81,82). Fig. 8. Healthy elderly men with low serum IGF-1 levels (n = 12) were treated with recombinant human GH (0.03 mg/kg three times weekly) for six months. Control subjects (n = 9) received no treatment. Serum IGF-1 levels, and body composition were measured pre- and post-treatment (mean ± SD; *, p < 0.05). Adapted from Rudman et al. (73). However, lack of hormonal specificity remains a concern, as serum ACTH, Cortisol and prolactin show post-dose increases after dosing with this compound (83). A GHRP-mimetic, MK-0677 has been tested in elderly subjects and has been demonstrated to have good general tolerability and to stimulate sustained increases in pulsatile GH secretion and serum IGF-1 levels in elderly subjects (Figs. 4 and 5) (83). If beneficial effects on strength, similar to those demonstrated using with GH (76) can be shown, the growth hormone secretagogues present the potential for a well-tolerated clinical approach to treating or preventing musculoskeletal impairment associated with aging. Nevertheless, this clinical target presents formidable obstacles to drug development. Age-related musculoskeletal impairment as a result of muscle wasting (sarcopenia) is not well recognized as a clinical syndrome. Thus, selection of an appropriate patient population remains difficult. In addition, given the inherent day to day variability in function in the 'frail' target population as well as the presence of a host of concomitant conditions, demonstration of clinically meaningful efficacy would be difficult. Catabolic States. Exploratory studies have been performed using rhGH in a variety of catabolic states including as an adjuvant to post-operative nutrition, in wound healing after skin grafting for burns, and in AIDS associated wasting syndromes. The latter condition has recently received US FDA approval as a treatment indication. In addition, exploratory studies have been performed using GH in hip fracture and hip replacement patients (84,85). As these conditions are characterized by GH resistance, it is unclear whether growth hormone secretagogues, with intact endogenous feedback mechanisms, will be able to stimulate sufficiently high levels of GH to achieve clinical benefit. To address this, a study was performed in which calorically deprived healthy young adult males were used as a model for a catabolic state (86). Subjects were treated with MK-0677 or placebo and nitrogen balance was measured using techniques similar to studies performed with GH and IGF-1 (87-90). MK-0677 improved nitrogen retention, resulting in a positive shift in nitrogen balance, suggesting potential clinical utility of the growth hormone secretagogues in clinical catabolic states. Obesity. GH has a lipolytic effect and has been proposed as a potential therapy for obesity (91). As treatment with GH is parenteral and expensive, growth hormone secretagogues have been considered as a possible alternative therapy for obesity. However, in obese subjects, the GH response to classical stimuli of GH secretion is generally suppressed (92-94). Several investigators have explored the responsiveness of obese subjects to growth hormone secretagogues. Loche et al. (59) administered hexarelin (2 ^g/kg iv) to a group of 10 obese prepubertal children (body weight approx 45-85% above ideal body weight). The GH peak and AUC in response to hexarelin was approx 50-60% lower than the response in 24 short normal prepubertal children. These results corroborate those previously described by Cordido et al. (38) who demonstrated a significant GH response to GHRP6 in obese adults (>30% above ideal body weight). As growth hormone secretagogues stimulate GH secretion in obese subjects, the potential for GH-mediated lipolytic effects exists. However, Svensson et al. (95) recently presented results of a study in which obese middle aged men were treated with MK-0677 for eight weeks. 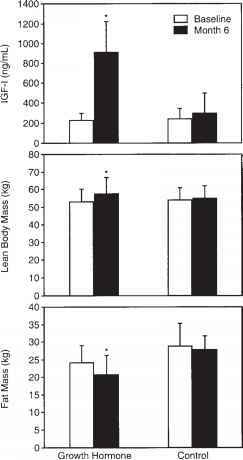 Serum IGF-1 levels and 'lean mass' were increased, but fat mass was unchanged. It appears, however, that some of the growth hormone secretagogues may exhibit a direct appetite stimulatory effect (96). 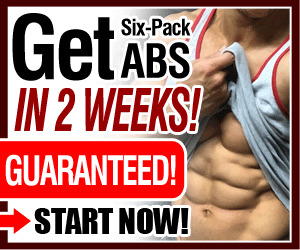 This may provide an explanation for the lack of fat loss in the former study, and could compromise the utility of using growth hormone secreta-gogues with this activity as a therapy for obesity. Diabetes. Poorly controlled Type 1 diabetes (IDDM) is characterized by relative malnutrition as a result of insulin deficiency. As with other states of malnutrition, diabetics tend to demonstrate GH resistance to a degree inversely proportional to the adequacy of their diabetic control (97). 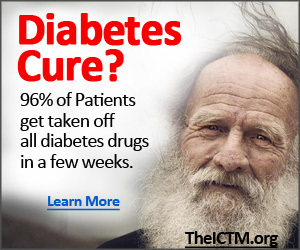 Thus, poorly controlled diabetes is characterized by elevated GH and low circulating levels of IGF-1 (98,99). In an effort to understand the mechanism of this GH resistance, Guistina et al. recently administered hexarelin (100 ^g iv bolus) to 10 nonobese adult men with Type 1 diabetes, and compared their GH responses to those of seven healthy adult men matched for age and body mass index (BMI) (100). Hexarelin stimulated a greater GH peak and AUC in men with diabetes than in normals (p < 0.05). As the growth hormone secretagogues are thought to have activity as functional somatostatin antagonists, the relatively greater GH response in diabetics may be owing to underlying increased somatostatin tone. The use of recombinant human IGF-1 is being explored as a potential therapeutic intervention in diabetes. However, it is unlikely that secretagogues would have clinical utility in this condition since increasing GH levels would tend to worsen glycemic control. Chronic Corticosteroid Exposure. Chronic exposure to corticosteroids is characterized by nitrogen loss and muscle wasting. It is possible that the anabolic action of GH may ameliorate some of the muscle wasting associated with Cushing's Syndrome or chronic corticosteroid therapy. Similar to the case of obesity, the GH response to standard GH secretory stimuli is decreased in patients chronically exposed to corticosteroids. Gertz et al. used L-692,429, a nonpeptide GHRP analog, to test whether growth hormone secretagogues can overcome this suppression (101). In a double blind, placebo controlled crossover design, nine healthy young men received L-692,429 0.2 mg/kg iv preceded by prednisolone 20 mg orally three times per day or placebo for 4 d. GH peak and AUC were decreased approx 55-60% after prednisolone compared to placebo treatment. Using a higher dose of L-692,429 (0.75 mg/kg) partially overcame the steroid-induced suppression of GH secretion. The findings in this model of corticosteroid exposure are similar to those in a study of patients with untreated Cushings Syndrome. In that study, 10 patients with Cushing's Syndrome and five normal adults received GHRP-6 100 ^g iv (102). The post-dose GH AUC was suppressed approx 77% in Cushing's Syndrome patients compared to normals. In contrast, Dieguez et al. (103) report lack of a GH response to GHRP-6 (1 ^g/kg) in four patients with Cushing's Syndrome. This apparent disparity could result from the smaller sample size in the latter report and to individual variation in responsiveness to GHRP-6. It is also possible that the difference in reported responsiveness is a result of different doses of GHRP-6, or to different etiologies of Cushing's Syndrome in the two reports. Although the response to growth hormone secretagogues appears to be suppressed in the presence of corticosteroid excess, the presence of a significant GH response in at least a subset of patients suggests the possibility of anabolic benefit. However, as most growth hormone secretagogues identified to date exhibit imperfect hormonal specificity, stimulation of small quantities of ACTH (and therefore cortisol) may complicate assessment of treatment status and could affect eventual clinical benefit. Thus, any long-term study in this population would require close monitoring of the pituitary-adrenal axis. Miscellaneous. One or more of the growth hormone secretagogues have been tested for GH secretory capacity in a number of other populations, including Down Syndrome (104), hyperthyroidism (105), and patients with polycystic ovary disease (106). In each of these populations in which the hypothalamic-pituitary axis is intact, an apparently normal GH secretory response to growth hormone secretagogues was documented.